Red River Gum is an amazingly smooth textured wood. Even dry wood cuts as easy as if it were green, though it does dull tools rather fast. Red River Gum prefers the flowing creek beds and rivers of Australia where they can live for over 700 years. Red River Gum has a reddish orange heart wood with a white sap. 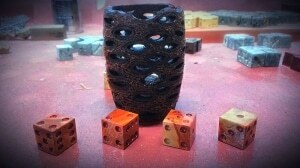 The wood is extremely dense and has a noticeable weight in your hand which makes for a wonderful feel in a set of dice. Red River Gum is one of my favorite woods to work with. Several of the red woods fade or change to brown. Is this wood stable? I also wonder if there are any photos of the polyhedrals in this wood. It looks gorgeous!